Attention Teachers & Librarians – there is a special note to you at the bottom of today’s entry. Be sure to scroll down! BH survived Day One with The Knee. He was an excellent patient. Didn’t complain one bit when I brought out the rope and tied him to the couch. Not really. The Knee let him sleep some last night and it’s looking like it will be a fast recovery. I have one more doc appointment this morning. I so begrudge all the time I waste on body maintenance; docs, dentists, etc., etc. But I am an ungrateful wench for even thinking that because at least I have health insurance. I should probably go flog myself. Oh, wait – I get to drive through another lake effect storm on the way to and from the doc. That will take care of my hubris and pissy attitude. But you didn’t tune in this morning to hear me whine. 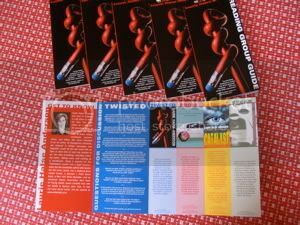 You tuned in to see the photos of TWISTED. The front cover of my new baby! 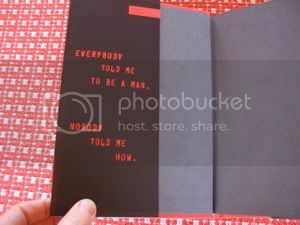 Inside flap, which I adore. 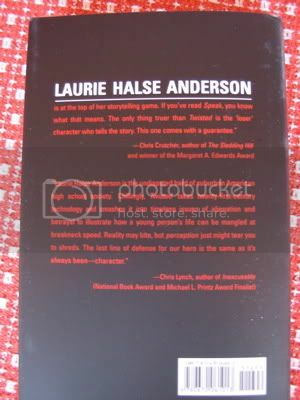 Back cover with blurbs from Chris Crutcher and Chris Lynch, which make me blush. TEACHERS! LIBRARIANS! Uncle Penguin sent me lots of reading guides – do you want a couple? If so, give me your snail mail address in the comments section, or email it to admin AT writerlady DOT com, and I’ll mail them off. Next week. AFTER this blasted draft is done. Although I can’t go (I’ll be at a writer’s conference – I will def be there next year), YOU should all go to the New York Comic Con. And then you should write to me and tell me the best parts. 3. plans for a Wiki. What else am I missing? Please let me know. It is so much fun to watch this field grow and thrive. I bow down to youse guys. I pulled a marathon writing weekend; 12 and 15 hour days chewing through the manuscript. Except for dry eyes, it was wicked fun. I am loving this…. being so deep in the story, fingers flying over the keys, the characters so close I can reach out and touch them – I love writing so much!!!!!! Today, however, few words will be written because of Family Obligations, which I will tell you about tomorrow. Hello, Madison, Alabama! Hello, Orson Scott Card! came up with the best gifts for a CATALYST lover (or fan of caffeine), ever. Yesterday’s writing went well. I achieved the first 2 of my 3 goals and my head did not explode. I had forgotten that I had a hair appointment; that messed me up some. By the time my hair was pretty and we finished dinner and talked to various kids on the phone, I was beat and did not go back to work. But I slept well, that was good. Kept seeing platters of hors d’oeuvres in my dreams. Now I am hungry. I haven’t gone to the gym since Sunday and it is making me crazy. I can’t wait for this book to be done…. well, at least this draft.